Rochester is welcoming hundreds of academic leaders who specialize in entrepreneurship and commercializing high-tech innovation at a global conference. 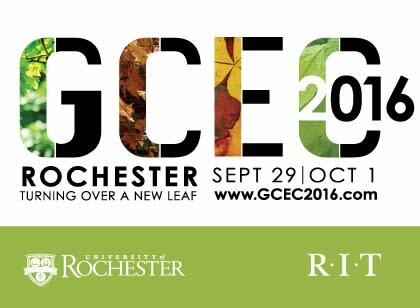 The 2016 Global Consortium of Entrepreneurship Centers (GCEC) — co-hosted by Rochester Institute of Technology and University of Rochester — will take place Sept. 29 through Oct. 1, featuring a variety of workshops, breakout discussions and keynote speeches from national and international entrepreneurship experts as well as UR and RIT faculty and staff. GCEC’s membership totals more than 225 university-based entrepreneurship centers. Hosting the conference in Rochester is a nod to the city’s national standing in innovation, patents and entrepreneurship, according to Richard DeMartino, endowed chair and director of RIT’s Albert J. Simone Center for Student Innovation and Entrepreneurship. “Rochester has a rich history of innovation, and it started 100 years ago with companies like Eastman Kodak, Xerox and Bausch & Lomb,” said DeMartino. “These organizations, in turn, helped in the creation of large universities, such as RIT and UR, and further helped foster economic development in the region. This conference, which provides tremendous visibility to our universities, is a reflection of the advancement of the region, and the partnership of RIT and UR leads to an approach that is complementary, where strengths in technology, design and business meet research in optics and medicine. There are a total of 425 registrants, the largest ever in the history of the conference. Guests are coming from colleges and universities all over the country, including: UNC Chapel Hill, Duke University, University of Florida, Stanford, UCLA, Georgetown University, Cal Poly, Syracuse, Cornell, MIT, among others. International guests: Australia, Brazil, Liberia, Mexico, Guatemala, Spain, Israel, UK, Sweden, Norway, Netherlands. U.S. Sen. Kirsten Gillibrand (D-NY) said the conference is great news for Rochester. The GCEC, which addresses the emerging topics of importance to the nation’s university-based centers for entrepreneurship, allows universities to network, benchmark and explore how to best promote entrepreneurship education and new-venture creation. It has become a vehicle for entrepreneurship centers to work together to share best practices, develop programs and initiatives, and collaborate and assist each other in advancing, strengthening and celebrating the role of universities in teaching entrepreneurs.